Power converter for IoT; improving lithium-sulfur batteries; compressible supercapacitors. At the International Solid-State Circuits Conference, researchers from MIT presented a new power converter that is efficient at a wide range of currents, which could be a boon for IoT sensors that have variable power requirements. The device maintains its efficiency at currents ranging from 500 picoamps to 1 milliamp, a span that encompasses a 200,000-fold increase in current levels. The researchers’ converter is a step-down converter and takes input voltages ranging from 1.2 to 3.3 volts and reduces them to between 0.7 and 0.9 volts. To accommodate that range of outputs, a typical converter will simply perform 1 million voltage measurements a second; on that basis, it will release anywhere from 1 to 1 million packets. Each measurement consumes energy. While for most applications the power drain is negligible, IoT is a different matter. The team’s converter thus features a variable clock, which can run the switch controllers at a wide range of rates. That, however, requires more complex control circuits. The circuit that monitors the converter’s output voltage contains an element called a voltage divider, which siphons off a little current from the output for measurement. Siphoning current lowers the converter’s efficiency, so in the researchers’ chip the divider is surrounded by a block of additional circuit elements which grant access to the divider only for the time a measurement requires. The team found a 50% reduction in quiescent power over the best previously reported experimental low-power, step-down converter and a tenfold expansion of the current-handling range. Researchers at the University of Southern California developed an enhancement for lithium-sulfur batteries which they say improves the cycle life and could make it competitive with lithium-ion batteries. While lithium-sulfur batteries have high storage capacity, they suffer from short cycle life, only able to be recharged 50 to 100 times. The team’s solution was a small piece of non-porous, fabricated material sandwiched between two layers of porous separators, soaked in electrolytes and placed between the two electrodes, which they call a “Mixed Conduction Membrane,” or MCM. 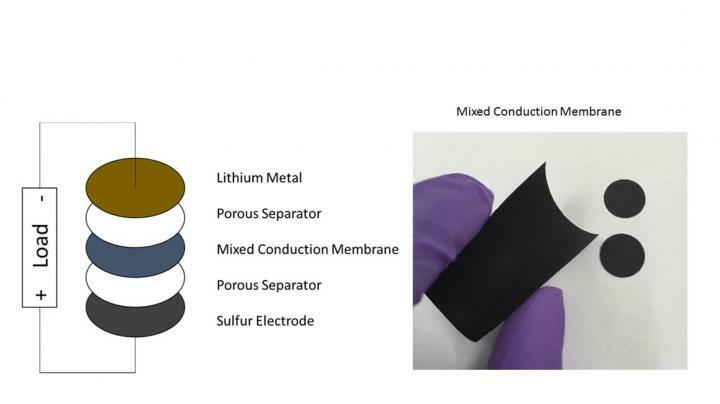 The membrane works as a barrier in reducing the shuttling of dissolved polysulfides between anode and cathode, a process that increases the kind of cycle strain that has made the use of lithium-sulfur batteries for energy storage a challenge. The MCM still allows for the necessary movement of lithium ions, mimicking the process as it occurs in lithium-ion batteries. The membrane solution preserves the high-discharge rate capability and energy density without losing capacity over time. At various rates of discharge, the researchers found that the lithium-sulfur batteries that made use of MCM led to 100% capacity retention and had up to four times longer life compared to batteries without the membrane. The actual MCM layer is a thin film of lithiated cobalt oxide, though future alternative materials could produce even better results. Researchers from the Council of Scientific and Industrial Research’s National Chemical Laboratory in India developed a compressible supercapacitor capable of powering soft electronics by using green tea extract. Powering soft wearable electronics with a long-lasting source of energy remains a challenge. Supercapacitors could potentially fill this role — they meet the power requirements, and can rapidly charge and discharge many times. But most supercapacitors are rigid, and the compressible supercapacitors developed so far have run into roadblocks. They have been made with carbon-coated polymer sponges, but the coating material tends to bunch up and compromise performance. To address the issue, the researchers prepared polymer gels in green tea extract, which infuses the gel with polyphenols. The polyphenols converted a silver nitrate solution into a uniform coating of silver nanoparticles. Thin layers of conducting gold and poly(3,4-ethylenedioxythiophene) were then applied. The resulting supercapacitor demonstrated power and energy densities of 2,715 watts per kilogram and 22 watt-hours per kilogram, enough to operate a heart rate monitor, LEDs or a Bluetooth module. Even a large strain impacted the device only minimally: the specific capacitance was found to be 253 F/g in its normal state, and 243 F/g upon compressing the device to 25% of its original size. The device still performed well even after being compressed more than 100 times. Hybrid approach pairs very thin silicon with printed interconnects and sensors. Safety-critical markets add new challenges for testing methodology, which can affect functionality, reliability and yield.